posted by Lisa Ace in Sponsored Post, advertisement, Clinton Crossings, Adult Patio Homes, real estate, open house, batavia. 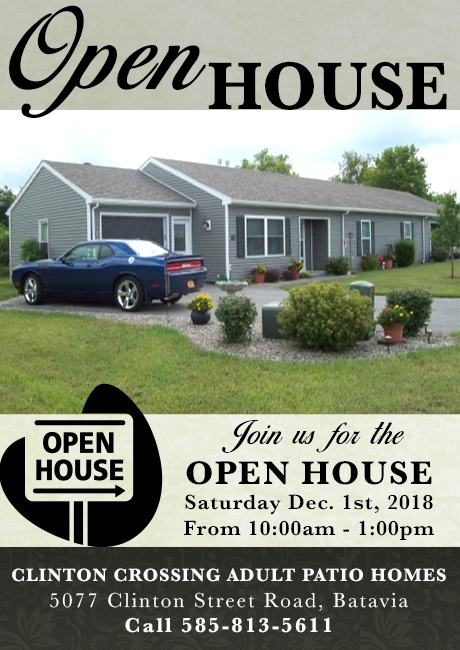 OPEN HOUSE -- SATURDAY Dec. 1st • 10 a.m. - 1 p.m. Whether you’re newly retired, considering retiring or just looking for maintenance free living, then Clinton Crossings is the place for you. Our new homes let you continue living independently with no steps or stairs to climb, plus it’s a relaxing community with friendly neighbors.